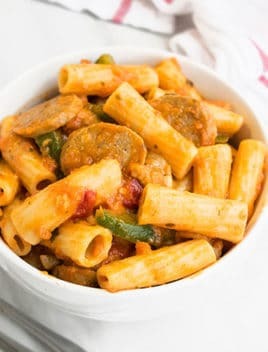 Quick and easy crockpot little smokies recipe with 3 simple ingredients- These cocktail sausages are a great appetizer for parties, game day, super bowl! 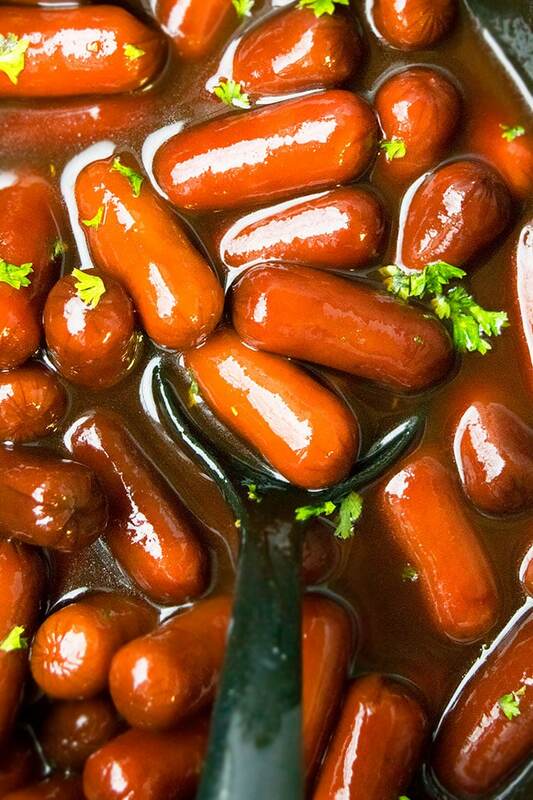 If you like these One Pot Grape Jelly Little Smokies, you are going to love today’s crockpot little smokies. They require 5 minutes of prep time only and they are so easy to serve as well! Kids and adults, both, love them because they are so flavorful and easy to eat with a toothpick. They are slightly sweet, tangy and sticky with a smoky flavor. 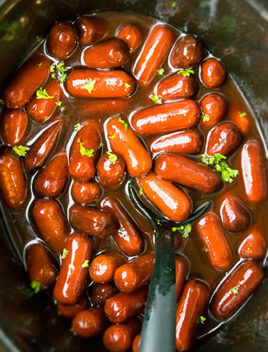 Also known as cocktail smokies, cocktail sausages, cocktail wieners, cocktail weenies or crockpot smokies! How to cook little smokies? How to make little smokies recipes? How to make cocktail sausages? Combine jelly and bbq sauce in a crockpot. Cook on high for 2 – 3 hours until sausages are warm and sauce is smooth. What to serve with the best little smokies recipe? 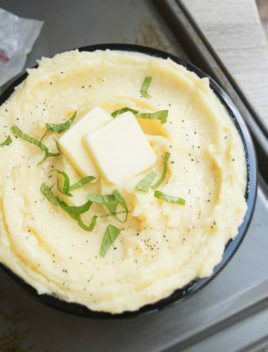 Typically, they are served on their own as an appetizer but you can also make something hearty like an “American bangers and mash” and serve them over these One Pot Creamy Mashed Potatoes. -Add 1-2 tbsp finely minced garlic to make garlic smokies. 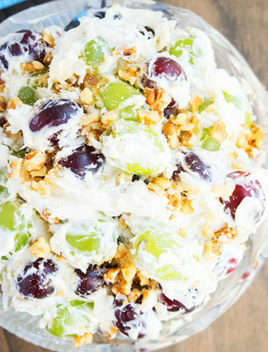 -Replace grape jelly with apricot jam/jelly for a fruity flavor. -Some people also like to add 1/4 cup tomato ketchup to add a hint of tomato flavor. -If you are serving these at Thanksgiving or Christmas, replace grape jelly with cranberry jelly. -Replace jelly with crushed pineapples to make sweet and sour smokies. -If you don’t have grape jelly, you can add brown sugar to make brown sugar little smokies. The sauce is made by combining together equal parts of grape jelly and BBQ sauce. These quantities can obviously be adjusted, based on your preference. You can use any brand of bbq sauce and grape jelly you like. 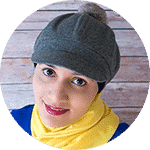 You can also use homemade versions. This is another very popular version. Basically, add some chili sauce and/or red chili flakes and/or jalapeños to give everything a subtle spicy kick. Some people replace bbq sauce entirely with chili sauce and that tastes wonderful as well. Serve them at birthday parties, New year’s parties, Christmas parties and even game day/ football season and they will disappear quickly. 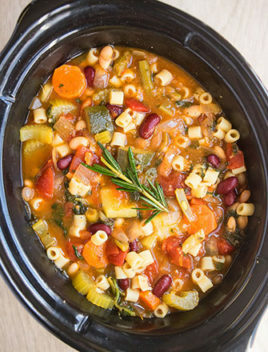 If you serve them in the slow cooker on the “Warm” setting, they will continue to stay warm and you don’t have to keep reheating. 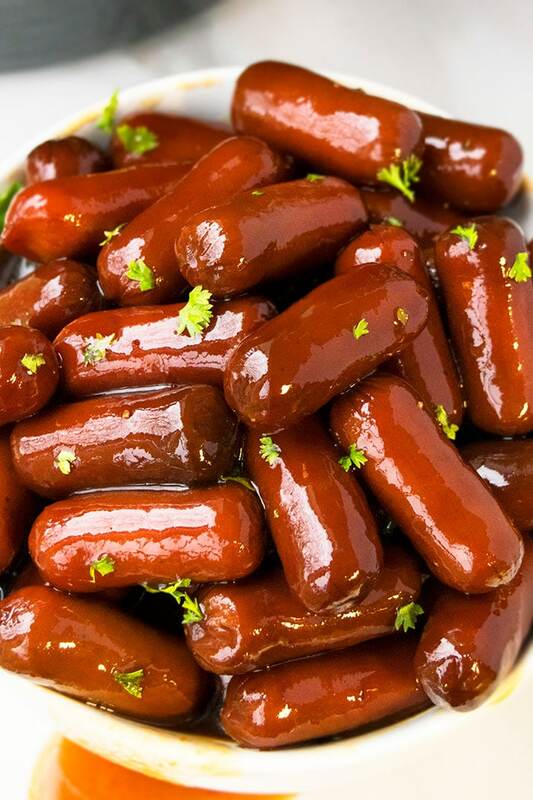 There are many appetizer recipes for little smokies sausages. 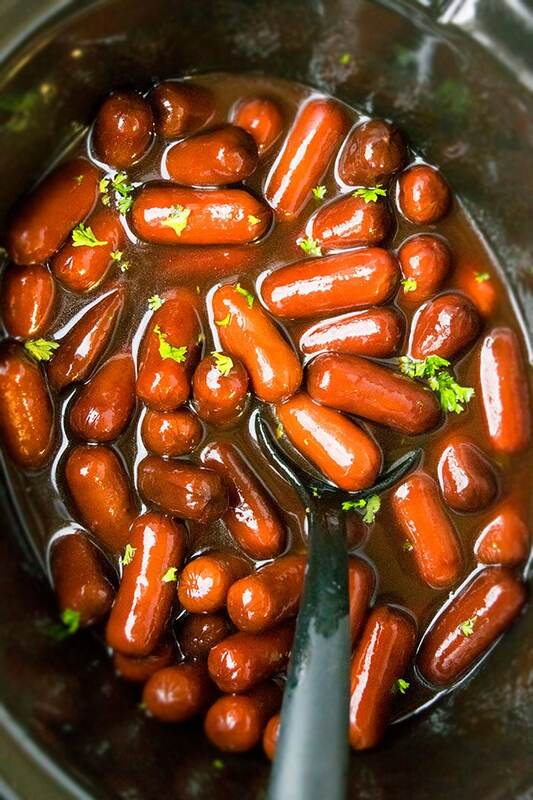 My favorites are bacon wrapped smokies, pigs in a blanket and these cocktail wieners. 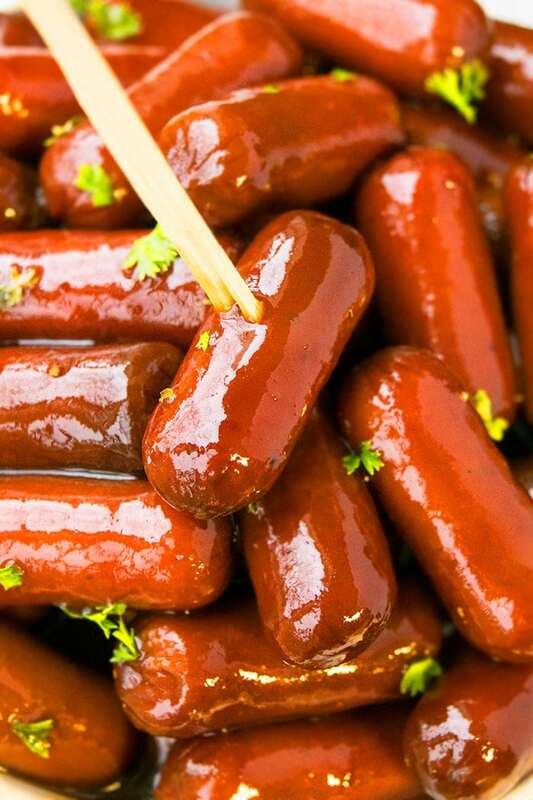 -If you don’t have mini sausages, you can use hot dogs or other sliced sausages of your choice. -You can also make these with store-bough pre-cooked meatballs instead of mini sausages. -Liquid smoke is optional. Bbq sauce already has a mild smoky flavor but my family just really loves it and I add a little for them. -Recipe can easily be doubled to feed a bigger crowd. -Do not use a smoky bbq sauce because the smoky flavor becomes overwhelming. Just use regular bbq sauce. In the slow cooker, add grape jelly barbecue sauce, liquid smoke (optional) and mix everything together. Don't worry about the lumps because they will eventually dissolve. Add smokies and combine everything together. Cook on "High" heat for 2-3 hours. Garnish with chopped parsley, if you like and enjoy! This is a great party snack! Little smokies are the perfect side dish or appetizer!!! We have them all the time at my house! Yum! That sounds great. I think my Aunt makes them like that.